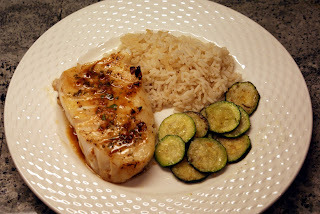 This recipe comes from fellow cook, mom and blog follower, Susan B. I am grateful to have a fish recipe as I am not very proficient in this area and the sea bass was not fishy tasting at all. To me, fish is either shellfish or fried. Neither of which falls into the “healthy in 2012” campaign which is still going strong after 5 days but I’m starting to feel the need for some chocolate cake soon. Back to Susan - somehow she finds time to cook while being a full-time professional, mom to 2 active boys, wife, cyclist, painter… She is a great cook even if she doesn’t wash her lettuce (she claims that it’s triple-washed – read the package). Whisk ingredients #2-6 + 3 t olive oil in small bowl. Season with salt and pepper to taste. Of course, fresh ingredients are always preferred but don't feel guilty if you have bottled lime juice or ground ginger powder (although use half the ginger if not using fresh). Brush a 9 inch round or square baking dish with the remaining 2 t olive oil. Arrange fish in the prepared dish and turn to coat. Sprinkle with salt and pepper. Spoon ½ T sauce over each fillet. Roast fish until just opaque in center, about 10-15 minutes (depends on thickness of fish). Serve (over rice is nice) and top with remaining sauce. Try it on halibut or other hearty (and probably less expensive) white fish. Be sure to add this one to your repertoire.